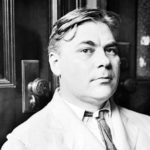 Donald Marquis was a humorist, journalist, and author. He was variously a novelist, poet, newspaper columnist, and playwright. He is remembered best for creating the characters Archy and Mehitabel, supposed authors of humorous verse. During his lifetime he was equally famous for creating another fictitious character, “the Old Soak,” who was the subject of two books, a hit Broadway play (1922–23), a silent movie (1926) and a talkie (1937). "I would rather start a family than finish one." "Happiness is the interval between periods of unhappiness." "Of middle age the best that can be said is that a middle-aged person has likely learned how to have a little fun in spite of his troubles." "Poetry is what Milton saw when he went blind." "A pessimist is a person who has had to listen to too many optimists."